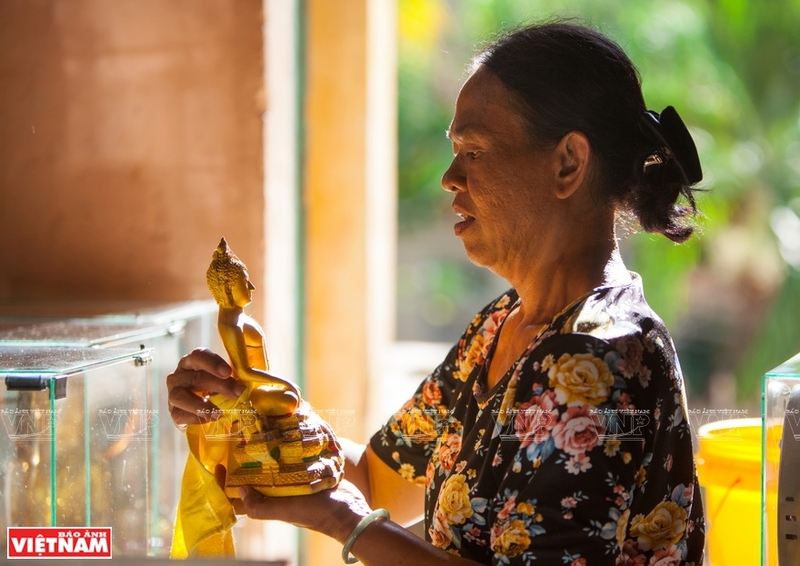 Theravada Buddhism plays a key role in the life of Khmer people in southern Vietnam. This school of Buddhism, which directs people toward the intellect and virtue, is regarded as the heart of the culture of the Khmer. We went to Tra Vinh province to attend the wedding of a Khmer friend, Thach Ri Con. The groom and bride were given blessings and teachings on marital faithfulness and filial duty by Buddhist monks. This is an indispensable formality in a Khmer wedding. Thach Ut, the wedding master, told us that Buddhist monks, who receive high respect in the Khmer community, consider educating younger generations as their responsibility. According to Khmer customs and belief, a person receives blessings from Buddhist monks when they are born and grow up, and meet Buddha after his/her death. So, the life of any Khmer person is attached to a pagoda, which is a sacred space connecting every person and family in the Khmer community. 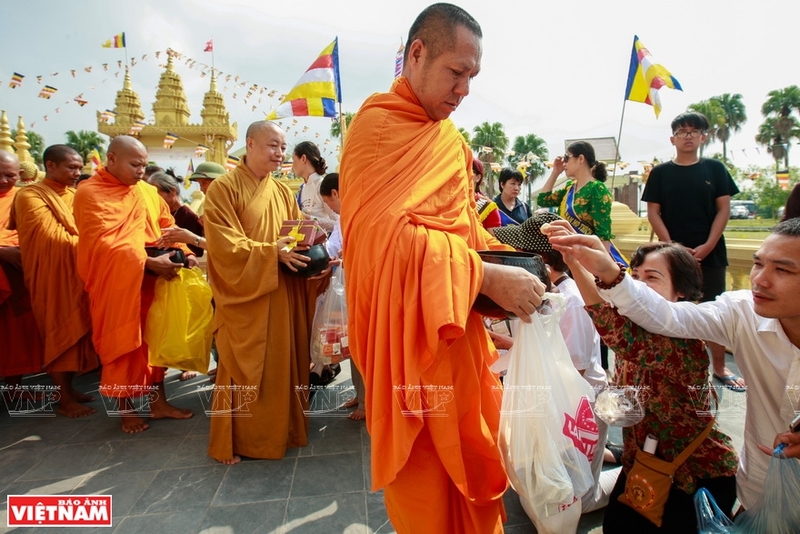 During the wedding, the families of the groom and bride both offer food to the monks. This not only shows their respect for the monks but is believed to bring happiness to the newlyweds and their families if the monks take the food. Offering food and fruit to Buddhist monks is a common practice in Khmer society, and is a beautiful cultural trait of the ethnic group. 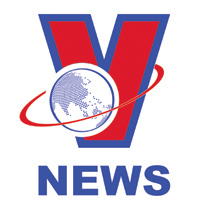 It reflects the philosophy of Buddhism which promotes a humane lifestyle. from the local pagoda’s well to wash his parents’ and grandparents’ feet to show his respect for them. After the wedding, we followed Thach Ut to visit a pagoda close to the groom’s home. The pagoda has architecture typical of the Khmer. Its entrance gate and surrounding walls are decorated with stylized art patterns related to the tales of Buddha. The pagoda has towers which are built by families for keeping the ashes of their dead family members. According to Khmer customs and belief, a person receives blessings from Buddhist monks when they are born and grow up, and meet Buddha after his/her death. So, a pagoda is the best place for a dead person to rest. At the age of 12, a Khmer boy must live and study in a pagoda as a Buddhist follower for a certain period (depending on his family’s conditions) before he becomes a grown-up. During the boy’s stay at a pagoda, which is also a way to show gratitude to his parents, he is taught Buddhist philosophy and knowledge as well as proper manners. After his stay at the pagoda, the boy can choose to become a monk or return home. That’s why, the life of any Khmer person is attached to a pagoda, which is a sacred space connecting every person and family in the Khmer community. 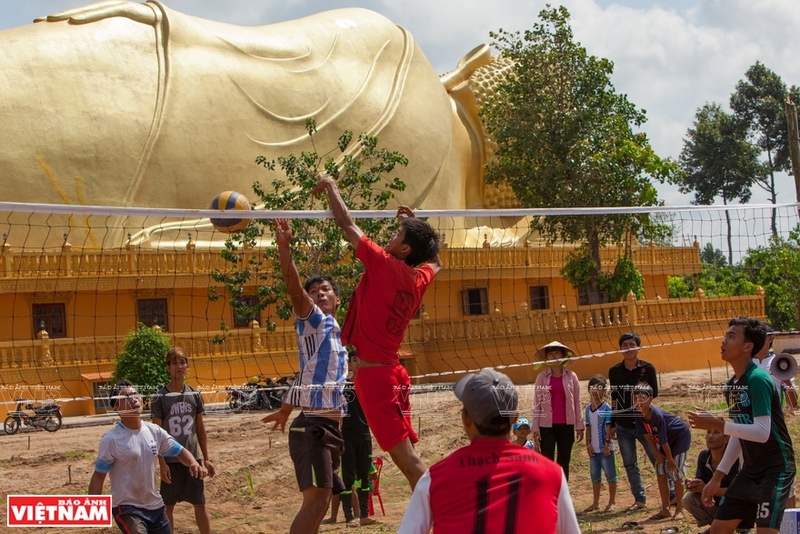 Khmer people always think of the pagoda in their native village, which reminds them that they should contribute to living good lives wherever they go, Thach Ut told us. 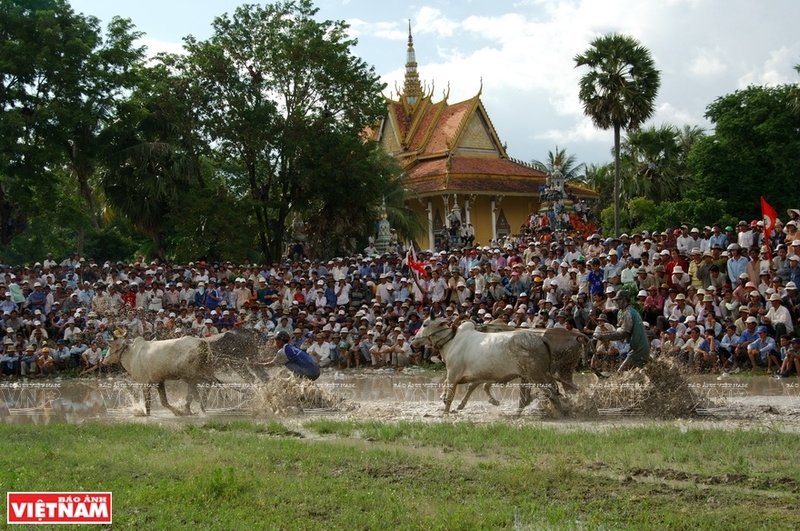 Khmer festivals and ceremonies are all related to Buddhism, which show the living philosophy of this religion. For the Khmer in southern Vietnam, a pagoda is not only a religious establishment, but also a cultural and social center and a common home of Khmer people. 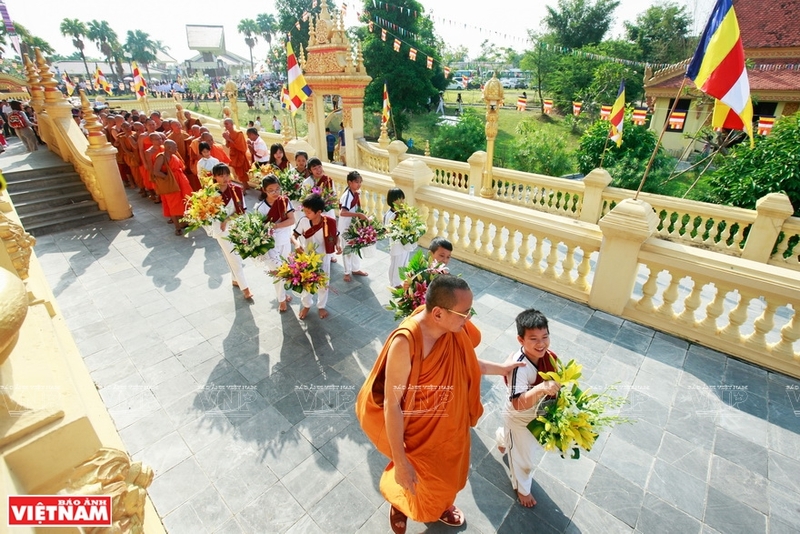 One of the Khmer’s three most important rituals in a year is Chon Chnam Thmay, the new year’s festival held on the 14th, 15th and 16th of April to show the Khmer’s respect for Buddha, their parents and ancestors. 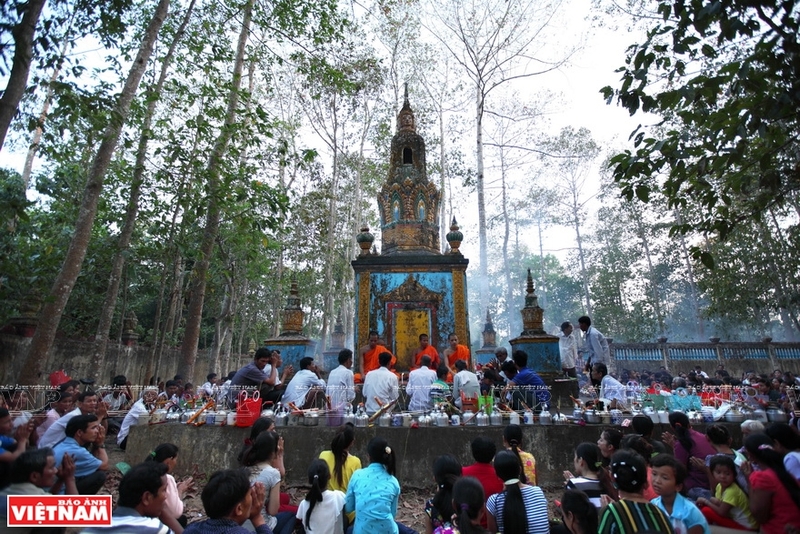 During Chol Chnam Thmay, families prepare offerings to their ancestors at home and in pagodas and bathe their elderly grandparents and parents. Weeks before Chol Chnam Thmay, the Khmer contribute money and labor to renovate the pagoda in the village where they live. 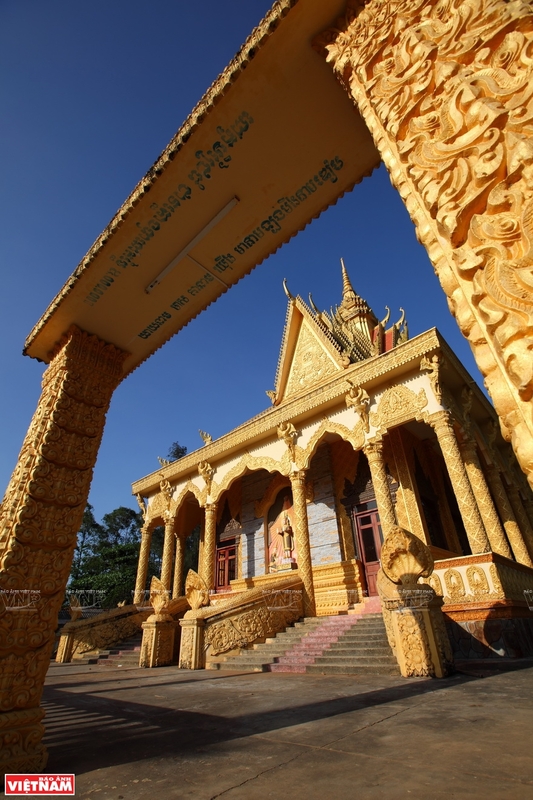 The pagoda is where they hold all important ceremonies of Chol Chnam Thmay during the three-day festival. The only ritual held at home is the offering to ancestors on New Year’s Eve. of a breed originating from Bay Nui area in An Giang province. 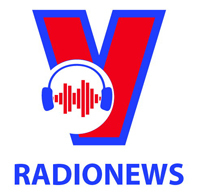 Photo: VNP Files. On the first day of Chol Chnam Thmay, people attend a ceremony at the village’s pagoda to recite Buddhist prayers to welcome the new year and pray for peace and happiness for the community. On the second day is a ceremony in which Buddhist followers offer food to monks and build hills of sand. During this ceremony, monks recite prayers to pray for peace for the spirits of the dead and happiness for the living. On the last day is a ceremony to bathe Buddha statues and monks. During Chol Chnam Thmay, beautifully decorated pagodas are crowded with people in colorful costumes bringing offerings to Buddha and their ancestors whose ashes are kept in pagodas. The offerings to the ancestors include a pair of banh tet (round sticky rice cake with pork and green bean filling), fruit and white cloth. 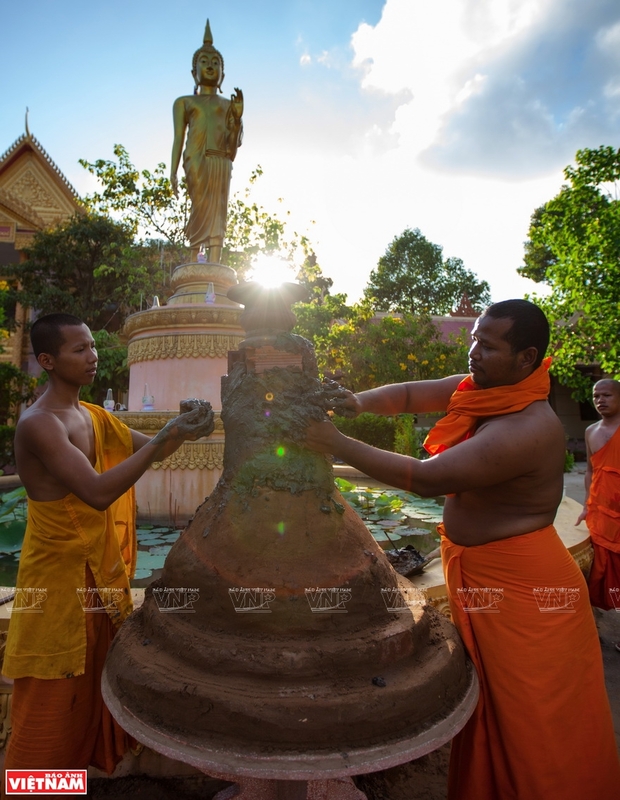 After these three ceremonies at the pagoda, Khmer families hold a ritual to bathe Buddhist statues at home and offer food and fruit to their ancestors on the family altars. 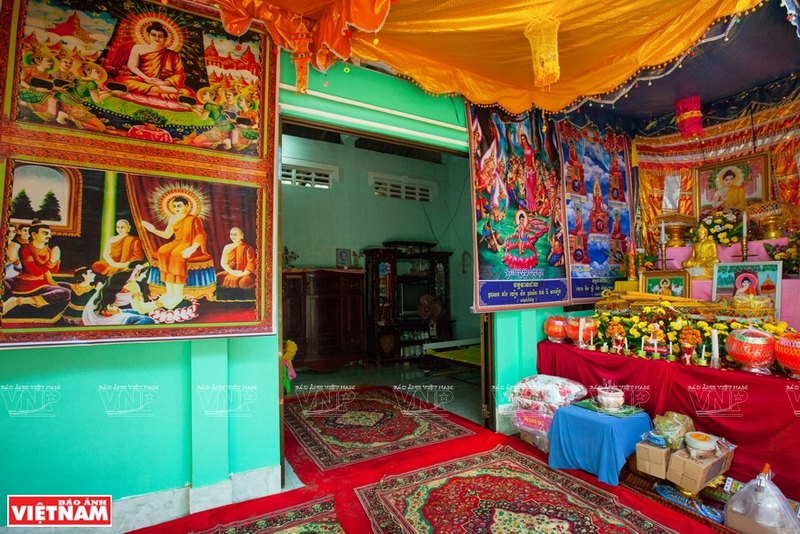 The second important ceremony of the Khmer is Xen Don ta which is held from August 29 to September 1 at home and at pagodas to make offerings to their ancestors. There are more than 600 Khmer pagodas in southern Vietnam with over 10,000 monks. Many of these pagodas are centuries old and are recognized a national cultural or architectural relic, including Ang, Met, Hang and Doi pagodas.